At Aesthetic Medical Educators Training, we provide a wide-range of medical aesthetics courses to help our customers receive the best training possible and help better their businesses. By attending an AMET event, you will give yourself the education and tools necessary to grow your customer base and provide the best service possible. Broadly speaking, aesthetic medicine is the specialty that deals with the modification of an individual’s physical appearance for any number of reasons. The scope of aesthetic medicine ranges from invasive procedures such as reconstructive surgery to non-invasive procedures that do not require general anesthesia. Over the past few years there has been an increased demand for non-invasive cosmetic procedures, with millions of Botox procedures performed each year. Other non-invasive treatments that have increased in popularity in recent years include sclerotherapy, microdermabrasion, chemical peels, and hyaluronic acid fillers. Additional revenue stream – Practices that perform non-invasive aesthetic procedures report an increased revenue, which may be as high as $20,000 – $30,000 monthly. Increased job satisfaction – Medical professionals who practice aesthetic medicine report an increase in job satisfaction. That is because they receive more gratitude and positive feedback from their customers who had cosmetic procedures performed than from their traditional patients. Furthermore, because aesthetic medicine is primarily cash – based, there is a decreased need to face some of the issues brought about by dealing with insurance companies. Increased job flexibility and a more relaxed lifestyle – Medical professionals who switched over completely to aesthetic medicine report a more relaxed lifestyle. This is due to reduced patient caseloads, reduced paperwork, malpractice insurance premiums, and regulations imposed by insurance companies and health care organizations. 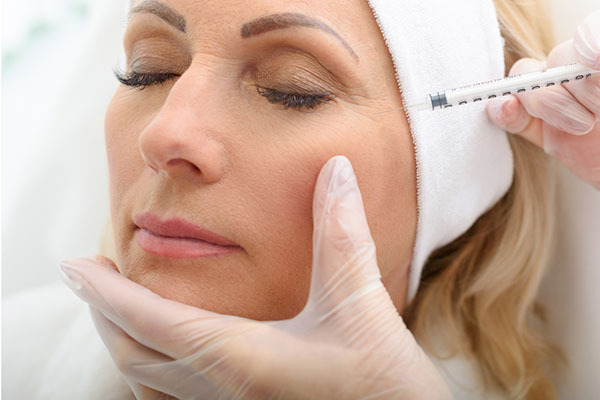 Botulinum toxin is an injection popularly used to erase wrinkles and lines around the face and neck. Dermal fillers are used to enhance facial features so as to minimize the effects of the loss of subcutaneous fat around the face due to aging. We provide an extensive hands-on training in our medical aesthetics class that teaches participants how to perform these procedures effectively. Our instructors offer comprehensive training, including demonstration, in our Botox and filler certification classes. This comprehensive 8-hour aesthetic medical training course provides attendees with certification for both Botox and injectable dermal fillers and is recognized by Allergan and Medicis for the purpose of product purchase. Intensive hands-on training is provided during the afternoon session, allowing participants to begin performing procedures immediately. All products and models are provided by Aesthetic Medical Educators Training at no additional cost to the participants (unless participant chooses to be a model). Click here for more information about the medical aesthetics training course and agenda! This comprehensive 8-hour aesthetic medical training class provides participants with advanced certification for both BOTOX and injectable dermal fillers and is recognized by Allergan and Medicis for the purpose of product purchase. Extensive hands-on training is provided after lunch during the afternoon session of the course, allowing participants to begin practicing and performing procedures immediately. All products and models are provided by Aesthetic Medical Educators Training at no additional cost to the participants (unless participant chooses to be a model). Learn more about our advanced Botox and dermal filler training course and agenda! Sclerotherapy is the use of injections known as sclerosants to get rid of unsightly varicose veins or spider veins on the skin. At AMET, our sclerotherapy training program for nurses and doctors includes learning about the different sclerosants as well as proper injection techniques. Microdermabrasion is the exfoliation of dead superficial skin by various methods including chemical peeling. Completion of our microdermabrasion training course at AMET prepares you to perform this treatment on clients immediately at your practice. If you are interested in starting an aesthetic practice, AMET has tools you need! We also offer private individualized training to suit your practice as well as online marketing webinars that teach you how to set up, market, and operate your aesthetic practice day to day. We provide webinars on various marketing and business topics. With all these available options, reach out to us today so that we can help you broaden your customer base and knowledge through our medical aesthetics courses. At AMET, we offer a variety of medical aesthetics courses if you are a dentist, nurse or physician, to suit the needs of your practice. We offer several training sessions at various locations all over the country; find the one nearest to you and register for a training session.